A total of 477 players took part in the second ever European Poker Tour event in Madrid and the first with it as a 'regular' stop instead of the Grand Final with a final table that combined the experienced EPT veterans with online qualifiers and recreational players. After a final table that lasted eleven hours, it was Frederik Brink Jensen that took home €495,000 and the EPT title. Jensen, who had previously come second in the Aussie Millions and made the final table of EPT Vilamoura last season, battle backed several times from being the short stack to secure his first major title. Jensen beat PokerStars online qualifer Fraser MacIntyre heads up in a short battle which the Dane dominated and won at the first attempt with against the of MacIntyre on a board of . At the start of the day it was Ricardo Ibañez who, as well being the only Spaniard, was the chip leader with nearly a quarter of the chips in play. However, despite his aggessive image on Day 4, Ibañez chose early on to sit back and let the others fight it out. The final table went nearly two levels before we finally lost our first player, Jason Duval pushing with against Stoenescu's – the latter flopping a pair of aces to send the Canadian to the rail. 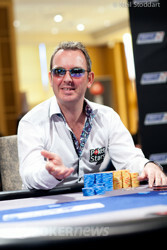 EPT regular and third time finalist Nicolas Levi was next to be eliminated. The Frenchman, in his familiar hat, was unable to climb out of the short-stack hole that he'd been in since the beginning of the day and lost out when he failed to spike with against Bruno Lopes' . Another regular, the occasionally fiery Ilan Boujenah followed him out of the door soon after when the Israeli got coolered holding top two pair with on an board against Lopes' after all the money went in on the turn. Play then continued for over two hours before we saw another chair taken away from the table and with it went Ibañez, who had been hoping to become the first Spaniard to win an EPT, his exit causing severe disappointment for his watching fans. It was during the 40,000/80,000 level and Stoenescu had raised from the small blind with Ibañez moving all in behind him from the big blind, the Romanian instantly called with queens which held against ace-deuce and catapulted Stoenescu into the chip lead. The pot that changed the tournament though was when Lopes flat-called a three-bet from Jensen with kings to see a flop where the latter bet/three-bet all in with and the Frenchman snap-called. Jensen was a 2:1 dog but caught the on the turn while the river was a brick. 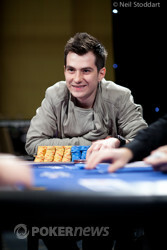 Lopes, one of the stars of the French rap scene, was crippled as a result but rallied briefly with a double up and subsequently won several more pots. He was undone though when he pushed with over the top of MacIntyre's initial raise, only for Stoenescu to reshove behind him with which held – though not without a sweat on the board. After playing a bit longer, the three managed to thrash out a deal guaranteeing MacIntyre €290,000, Stoenescu €330,000 while chip leader Jensen picked up €385,000 with the rest still to play for. Stoenescu busted out in third place in a big pot against Jensen when his failed to hold against the Dane's straight flush draw on a flop of . The on the turn gave the Romanian a few outs but he missed on the river. This left Jensen holding a 2:1 chip lead over MacIntyre and victory was sealed for the Danish pro after a short 15-minute heads up battle. 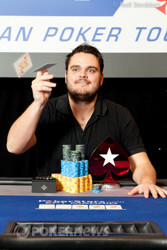 Congratulations then to Frederik Jensen and all the players who made the money here in Madrid. The PokerNews Live Reporting Team will be back next week to bring you all the news from the next EPT in Campione, Italy! From the button, Fraser MacIntyre got his last 2.43 million into the middle with . He can't be faulted for shoving with a medium ace, but he ran into a better one. 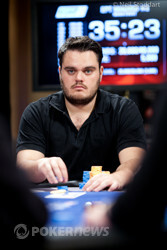 Frederik Jensen quickly looked him up, and his dominating had him five cards from an EPT title. The flop changed nothing, and both players were standing nervously as they awaited the dealer's fate. Again, not much changed except the fact that MacIntyre was now looking for one of Jensen's tens as his only three outs. The dealer burned one more time and dropped the final card of the day on the deck. It was quite an effort for the Scot, stepping away from his day job as a pub and nightclub owner. Suppose that makes it more of a "night job", actually. In any event, this result is many times over larger than his previous best, a sub-€20,000 win in a side event at this past WSOPE. His efforts are even more impressive when you consider how he earned his ticket to this event, via the Steps satellites on PokerStars. His efforts have come up just that short of his goal, but he's managed to parlay that little investment into €290,000 in cash in just five days' time. Frederik Jensen has gone to overwhelming favourite after he made a straight on the river, nearly potted it, and got a call. Fraser Macintyre limped on the button and called when Jensen raised it up. The flop came and Jensen led for 290,000. Call. The turn was the and both players checked to the river where the Dane led for 940,000. Macintyre thought for a long time before calling. Jensen opened in a flash for the rivered straight. The Scot winced and mucked his hand. Fraser MacIntyre mini-raised preflop, and Frederik Jensen gave him some action from the big blind. They both checked through the flop, and Jensen checked again on the turn. He called a bet of 275,000. The filled out the board, and it checked through again. MacIntyre was first to show, but he was reluctant to do so. 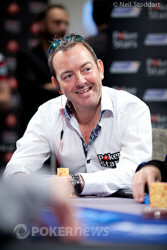 Jensen let him off the hook by tabling his , and that put pushes him over the ten-million-chip milestone. It didn't take long after the deal to get this thing down to heads up. Andrei Stoenescu raised from the small blind and Frederik Jensen defended his big blind. The flop fell and it turned out to be an action one. Stoenescu led for 260,000 and called very quickly when Jensen shoved on him. Jensen tabled the draw to everything and Stoenescu opened . The Romanian was ahead but Jensen was favourite to win the hand. The board ran out to complete the Dane's flush. He now takes in a two to one chip lead to heads up play. From the button, Andrei Stoenescu opened to 240,000, and Fraser MacIntyre defended his big blind. Heads up, the dealer spread out . Both men checked through that flop, and the turn brought the . MacIntye checked again. When Stoenescu bet 256,000, though, he was check-raised to 600,000 straight. Stoenescu called. The landed on the river, and MacIntyre wasn't slowing down now. He stacked out 750,000 into the pot, and Stoenescu tanked for a minute or so and called. MacIntyre, we think it's safe to assume, had gotten there on the river. He turned up for two pair, and Stoenescu was not impressed. He shook his head and mucked, and the two men have traded places. 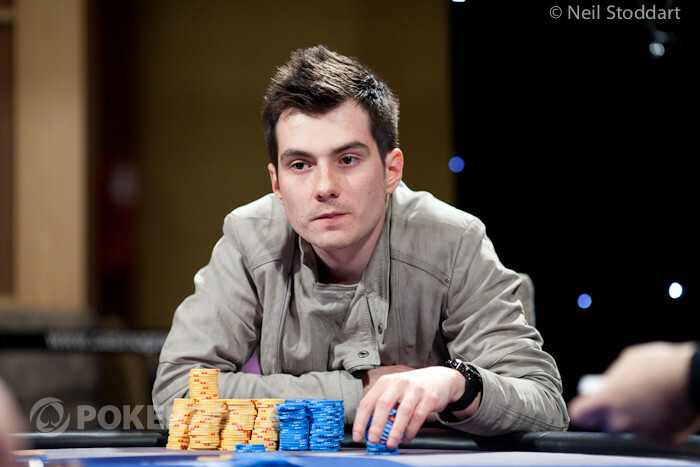 Stoenescu is now the short stack with less than 3 million chips. After a lot of discussions and number crunching a deal had been agreed. Frederik Jensen is guaranteed €385,000, Andrei Stoenescu is guaranteed €330,000, and Fraser Macintyre is guaranteed €290,000. That leaves €110,000 in the pot to play for.